anyway Italy did good start to unchain from US and EU. The US, UK, and the EU are all competing with each other to see how fast they can go downhill. Nero fiddles while Rome burns..............only not this Rome. Italy should just tell their EU critics they'l stop doing business with China when the UK, France etc stop their huge arms sales to the Saudis and other rogue states spreading global terror. Didn't Italy make a deal once with another guy that was going to help their eco\nomoy and make them one of the most powerful countries in the world? Seems to me that they were told it was a bad idea then too. With their economy in recession Italy will take money from wherever. Who can blame them? The UK Government has no shame about asking China for money to build a nuclear power plant and Chinese firms have been investing in UK property, construction and utility companies for a decade. "Xi flew to the Sicilian city Palermo for a private visit on Saturday afternoon"
To meet the "God Fathers"???? 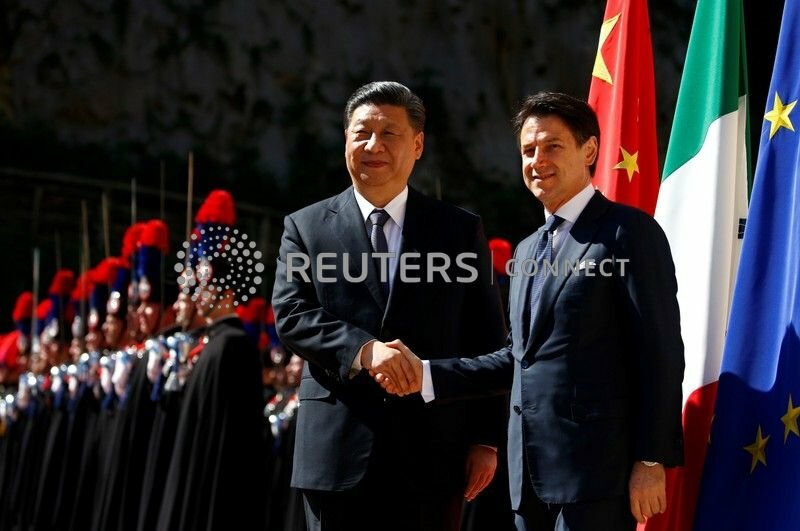 Sure hope China is on the hook for Italy's debt crises now. "...anyway Italy did good start to unchain from US and EU." Conte & combo need plenty of coin indeed, expensive - shall we call it 'election promises' - are now to fulfill in order to, well, bring happiness to the people (lol). With basic income (EUR 780.- for est. 5 mio eligible recipients) and early retirement (300-400k people at 62 instead of 67) Italy's government may have scored among the voters, but of course these gifts cost money that the state just does not have. I was only talking about Chinese money because that is the topic, but money and people flood the country from just about anywhere. Rock up with millions and you're welcome. Shinawatras are a good example.